Muskerry News | Blarney Students run away! 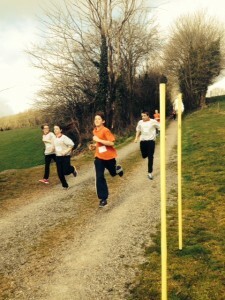 Scoil Mhuire gan Smal students took part in a one mile challenge last month as the grand finale of the school’s Health Week initiative, the event encouraged students to take on the challenge at the fantastic new running trail located in Blarney Driving Range. First and second year students took part in races in their own category where they could run, jog or walk and record times were achieved on the day. Second year student Craig Hourigan had the overall fastest time of 5mins 21secs followed by a first year time of 5mins 36secs by Michael O’ Mahony. The fastest first year girl was Eimear O’ Reilly who made it round the course in 6 minutes 26 seconds and second year Triona Twomey finished in 7mins and 11secs. The conditions were ideal with sunshine throughout the afternoon adding to the excitement and enthusiasm of the runners. In addition to the overall health benefits, funds were also raised for SMGS students travelling to Lourdes in June to take part in charity work there. Many thanks to the warm welcome extended to SMGS students by Gerard Forrest of Blarney Driving Range and Running Trail.